This post originally appeared on Upworthy. Donald Trump called for an end to all Muslim immigration into the United States and it was pretty scary. That’s old news by now. But the cool part you might not have heard about? As a response, a group of faith leaders from lots of different religions united in support of Muslims. The organizers of the letter included folks from many different religious groups: Sister Simone Campbell, leader of “Nuns on the Bus”; Rabbi Sharon Brous; Reverends Otis Moss and Dr. Jacqui Lewis; Bishop Gene Robinson; and Linda Sarsour, executive director of the Arab American Association of New York. The letter’s authors represent an astonishingly diverse mix of religions that don’t usually come together—Sikhism, Islam, Catholicism, Judaism, and Protestantism, among others. While different in their faiths, the authors (who are all fellows at the Auburn Theological Seminary) are dedicated to bridging divides and building communities among people of all cultures and beliefs. After hearing Trump’s drastic and discriminatory measures, these 15 senior fellows at Auburn banded together to take action through their vast faith network. In the first few hours, the letter immediately garnered over 4,000 signatures supporting Muslims. Today, over 25,000 people have signed it. 7,000 of those people are faith leaders. The list ranges from Quakers to atheists, notes Michelle Reyf, director for Groundswell at Auburn and one of the main campaigners behind the letter. The goal of the letter, she adds, was not only to call for people “to be transformed by a moment of compassion” but also to take action in the outside world. To make sure their words didn’t fall on deaf ears, these faith leaders took their letter offline with handmade deliveries to Muslim communities around the country. Beginning Dec. 11, in coordination with local imams and Muslim leaders, Auburn’s senior fellows organized national deliveries of their letter in person to mosques, Muslim community centers, and Muslim Community Network offices. In addition, all 25,000 signers of the letter were invited to deliver the letter to neighbors, friends, and colleagues. Rabbi Sharon Brous, an Auburn fellow and one of the authors, delivered her letter to the leaders of LA’s Muslim community on Dec. 13. 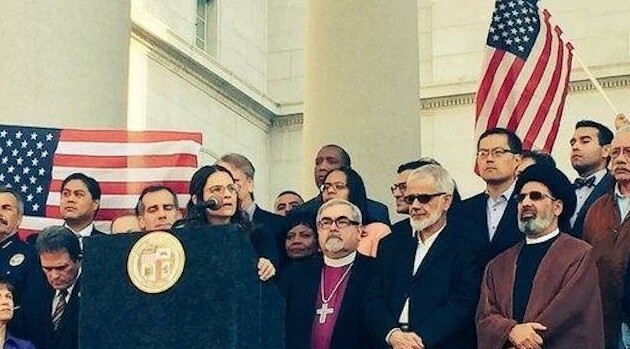 She stood with the mayor of Los Angeles, the mayor of San Bernardino, and the heads of LA’s Sunni and Shiite communities (the first time the two leaders have stood together publicly) and gave a rousing speech on the dangers of Islamophobia and religious persecution. Another batch of the deliveries took place in New York City on Christmas Eve, the same day as the Prophet Muhammed’s birthday. Reverend Lewis, who participated in the delivery of the letter that day to the Muslim Community Network offices, described the experience as profoundly moving. “A rabbi putting this letter in the hands of a Muslim leader surrounded by clergy and laypeople was the most amazing way to have Christmas,” she says. Deliveries have now taken place nationally in California, Colorado, Michigan, Indiana, Florida, Oklahoma, Georgia, Massachusetts, New Jersey, and of course, New York. Stories like these are important because they serve as a reminder that love is one of the best ways to combat hate. As message of divisiveness continue to dominate the headlines, I find the story of these faith leaders reassuring. Their unity and peaceful teamwork didn’t make front page news in most places, but it had a major impact on the ground for people all around the country. If such a distinct group of religious leaders can find common ground together, the rest of us really don’t have much of an excuse.